This map has been made for the Teamliquid Map Contest 12 for the Challenge #2 – “Slowly but surely”. This contest is organized by Teamliquid at the request of Blizzard Entertainment. 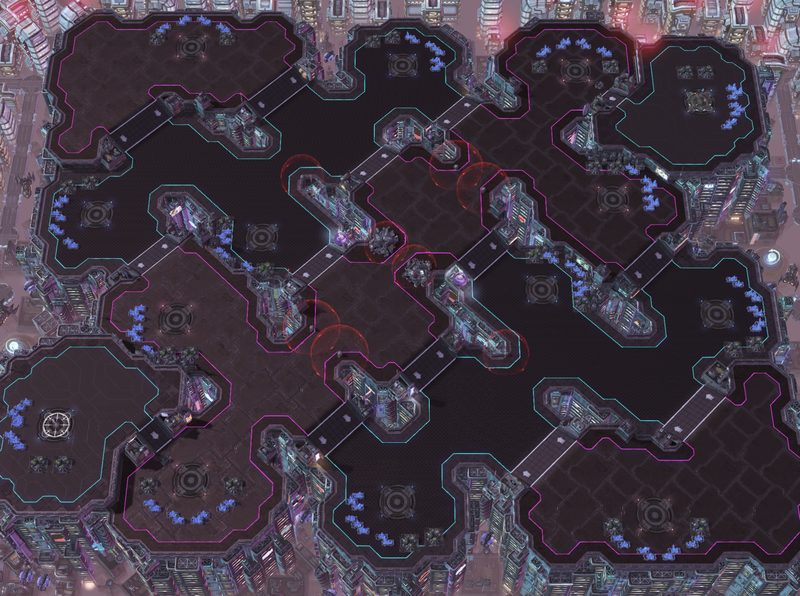 Inhibitor Zone generators (IZG) are a new game mechanic which slows both ground and air units in its radius colored in red. Because it’s a new mechanic, the first map in the official ladder map pool that uses IZGs must be simple. This is why this map is very simple and built in a way that it simply doesn’t work without IZGs. I use it mainly to increase the travel time between the second bases from 26 to 30 seconds. For balance reasons, the absolute minimum travel time is 28 seconds. This way, the IZGs are mandatory on this map to make it playable. In the secondary paths, there is one IZG that is placed half way between the players. It covers only one half of the choke so players are encouraged to micro manage their units more in these areas. Because of the structure of the map, the game starts out in a very normal way but as the game progresses, the players take bases that are very close to the opponent. This kind of map structure wouldn’t be possible without IZG. For the theme of the map, it is based on the Outrun aesthetic with a strong use of Cyan and Pink in an futuristic urban environment. I made a sample in september 2018 to see if it is feasible and i consider the result to be alright. This aesthetic style is time consuming so i took advantage of the small size of this map to do it here. The name of the map is simply a mix of very common words found in this aesthetic style.